And next we find ourselves sitting in a bar overlooking the Atlantic waves crashing onto the Galician coast not too far from the end of the pilgrimage trail at Santiago de Compostelo and where Ceri and her loved ones found themselves on part of their Iberian adventure this summer. The locals converse in Gallego, somewhere in-between Portuguese and Spanish, but we’re going to stick to the national language. In between mouthfuls of the local seafood specialities, and preferring to utter more stylistic language in the land of Don Quixote than the more prosaic yet practical phrases of ordering crab in a restaurant, we made – and by that I mean Alan of Hello Cruel World and his lovely Gallegan partner Sonia, with my persistence and persuasion – some poetic little plants with Spanish colours. It’s an ordeal, trying to find rhyming words to fit the poem structure, and Alan gained as much as I did as he raked through his lexical sets. So thank you very much to both, and in particular to Sonia for supplying the audio so the fruits of that lazy afternoon a few years ago can now go public. After you’ve watched the video, how about the following activity? It’s good fun, and good revision too. 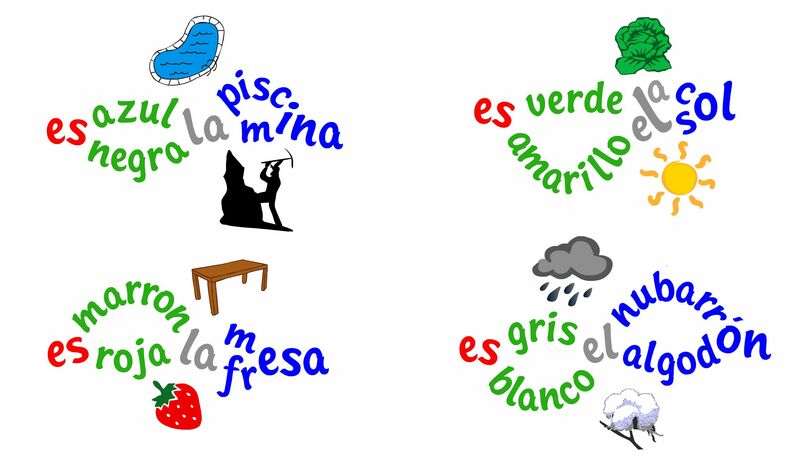 Try a Spanish Puzzle! Put the words back in the language plant. Las langostas, y ¡incluso las gambas! My mouth is watering! Thanks for this, Chiew. ¡Como mola! ¡Muchas gracias Dave! Cuando vengais a Galicia te tendremos preparado un regalito que seguro que te encantara. ¡Un abrazo cariño! Besos a Lida. Thanks, David, for being a Versatile Blogger. Nice! And nice to hear Sonia’s voice, too!! I miss Galicia! You are currently reading Spanish Colours at language garden.